IC Insights will release its August Update to the 2016 McClean Report later this month. This Update includes an update of the semiconductor industry capital spending forecast, an analysis of the IC foundry industry, and a look at the top-25 semiconductor suppliers for 1H16, including a forecast for the full year ranking (the top 20 1H16 semiconductor suppliers are covered in this research bulletin). The top-20 worldwide semiconductor (IC and O-S-D—optoelectronic, sensor, and discrete) sales ranking for 1H16is shown in Figure 1. It includes eight suppliers headquartered in the U.S., three in Japan, three in Taiwan, three in Europe, two in South Korea, and one in Singapore, a relatively broad representation of geographic regions. The top-20 ranking includes three pure-play foundries (TSMC, GlobalFoundries, and UMC) and six fabless companies. If the three pure-play foundries were excluded from the top-20 ranking, China-based fabless supplier HiSilicon ($1,710 million), U.S.-based IDM ON Semiconductor ($1,695 million), and U.S.-based IDM Analog Devices ($1,583 million) would have been ranked in the 18th, 19th, and 20th positions, respectively. Thirteen of the top-20 companies had sales of at least $3.0 billion in 1H16. As shown, it took $1.86 billion in sales just to make it into the 1H16 top-20 semiconductor supplier list. There was one new entrant into the top-20 ranking in 1H16 as compared to the 2015 ranking—AMD, which replaced Japan-based Sharp. In 2Q16, AMD registered a strong 23% increase in sales while Sharp was moving in the opposite direction logging a 13% decline in its 2Q16/1Q16 revenue. Intel remained firmly in control of the number one spot in the top-20 ranking in 1H16. In fact, it increased its lead over Samsung’s semiconductor sales from only 20% in 2015 to 33% in 1H16. The biggest upward move in the ranking was made by Apple, which jumped up three positions in the 1H16 ranking as compared to 2015. Other companies that made noticeable moves up the ranking include MediaTek and the new Broadcom Ltd. (the merger of Avago and Broadcom), with each company moving up two positions. 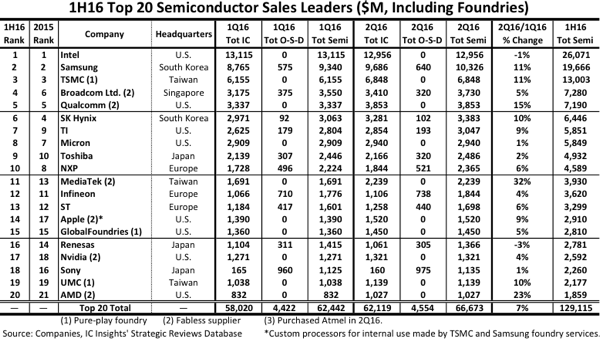 Apple is an anomaly in the top-20 ranking with regards to major semiconductor suppliers. The company designs and uses its processors only in its own products—there are no sales of the company’s MPUs to other system makers. IC Insights estimates that Apple’s custom ARM-based SoC processors had a “sales value” of $2.9 billion in 1H16, which placed them in the 14th position in the top-20 ranking. In total, the top-20 semiconductor companies’ sales increased by 7% in 2Q16/1Q16. Although, in total, the top-20 2Q16 semiconductor companies registered a 7% increase, there were seven companies that displayed a double-digit 2Q16/1Q16 jump in sales and only two that registered a decline (Intel and Renesas). The fastest growing top-20 company in 2Q16 was Taiwan-based MediaTek, which posted a huge 32% increase in sales over 1Q16. Although worldwide smartphone unit volume sales are forecast to increase by only 5% this year, MediaTek’s application processor shipments to the fast-growing China-based smartphone suppliers (e.g., Oppo and Vivo), helped drive its stellar 2Q16/1Q16 increase. Overall, IC Insights expects MediaTek to register about $8.8 billion in sales in 2016, which would represent a 31% surge over the $6.7 billion in sales the company had last year. As expected, given the possible acquisitions and mergers that could/will occur over the next few years, the top-20 ranking is likely to undergo a significant amount of upheaval as the semiconductor industry continues along its path to maturity.